Labor Day Weekend marks the official end of summer, one that Hollywood will be sad to say goodbye to. And although it won't exactly be going out with a bang, the summer season closes off with at least a couple of films that could transcend Labor Day's reputation as a dumping ground. With cheap horror films becoming a reliable source of income for studios, it's only natural that they would turn to remakes of classic titles in the genre. It started with Michael Bay's production company redoing the Texas Chainsaw Massacre films, which were surprising hits, with the first one grossing $80 million in total. 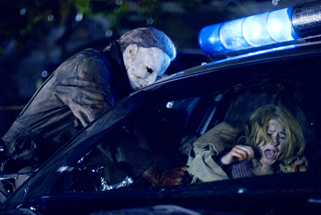 The latest is Halloween, which has been handed to death metal musician/director Rob Zombie. Bringing film's version of the Boogeyman in Michael Myers back to the screen, Zombie attempts to update it with his frenetic directing style as seen in House of 1000 Corpses and The Devil's Rejects, as well as plenty of blood and guts. In the film, Myers is accidentally released from his mental institution, after which he heads back to his hometown in search of his dear old sister, with whom he has a long standing score to settle. Involving, you know, knives, and stabbing her with them. And if other people happen to get in his way in the meantime, they can be stabbed too. Zombie looks to have delivered a rather intense film. Zombie is a well-known proponent of dialing it up to 11 with gore, and given an opportunity like this, he will certainly have taken it. This gives this film a bit more credibility in horror circles than it would otherwise have and might save it from being "just a remake" in the eyes of aficionados. Reviews are horrible, but then when have horror fans cared about that? I think the combination of the classic franchise name, Zombie's street cred and the lack of much horror lately should push this to the top of the box office this weekend, with about $21 million over four days. The weekend's new comedy offering, Balls of Fury, got a jump on the weekend by opening on Wednesday. An absurdist sports movie parody in the vein of Dodgeball, Balls of Fury delves into the world of underground table tennis, or as Christopher Walken might call it... ping-pong. If the idea of Christopher Walken saying that makes you smile a little, then this is the film for you. If not, then you're probably scratching your head that this is fodder for a major motion picture. Relatively unknown (but Tony Award winning!) Dan Fogler stars in the film as a former ping-pong pro working an act in the Vegas scene until he's recruited to infiltrate a combination ping-pong/martial arts tournament run by the evil Mr. Feng (Walken, milking his general weirdness for all it's worth). General wackiness ensues, with screenwriters Thomas Lennon and Ben Garant (most known for Reno 911!) throwing every joke they can think of up on screen to see what sticks. Most critics are saying that it's not too many of them, but the commercials do pack a fairly impressive number of gags into 30 seconds. Balls of Fury debuted with a modest $1.7 million on Wednesday, in second place behind Superbad, the other raucous comedy in the market right now. There's a fairly large overlap between the two audiences, which should eat into the overall figures for this one, but this film faced a pretty tough uphill climb anyway. Comedy these days seems to be all about branding, and without a big name star or producer, this film won't have much of a chance to break out. Look for about $10 million over the four-day holiday period.